There are some unusual fare being sold at state fairs. Funnel cakes, cotton candy and corn dogs are still favorite foods at festivals but sometimes we find deep fried Twinkies, cheesecake-on-a-stick and Frito Pie on the menu. In Oklahoma, where we used to live, and especially in Texas, where we currently live, Frito Pie is a popular concession stand concoction. Not even a pie, it is basically chili con carne and shredded cheese (and sometimes topped with other vegetable garnishes and a dollop of sour cream) traditionally served right in a bag of crispy corn chips! 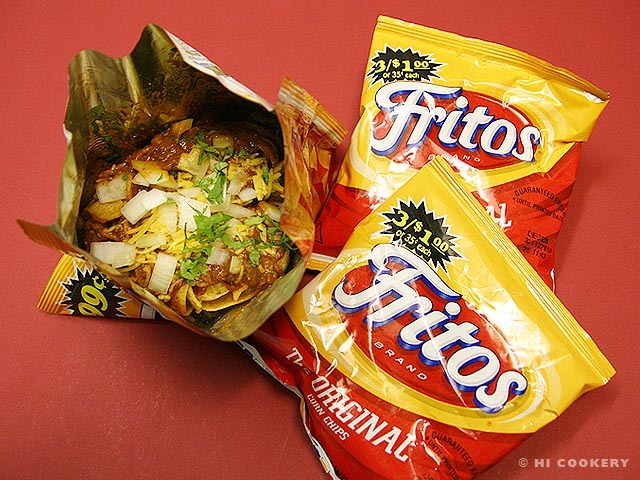 Frito-Lay Company, based in Dallas, Texas, created its Fritos Chili Pie recipe in 1932 to market its new corn chips as a key ingredient. 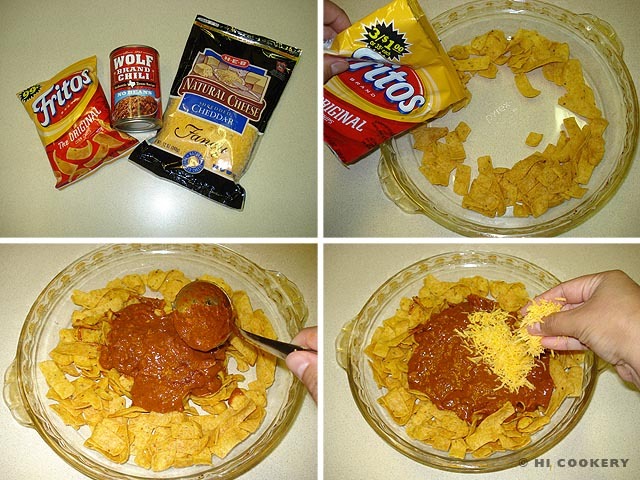 Since then, Frito Pie has become an American/Tex-Mex classic with various versions for a remix. We present two methods of making Frito Pie—served in the bag of Fritos corn chips and baked in a pie dish—for National Corn Chip Day. Cut open the side of a bag of Fritos. Scoop some hot chili con carne over the corn chips. Sprinkle with cheddar cheese (the heat from the chili will melt the cheese). Add onions and the cilantro garnish (optional) on top. Serve immediately. 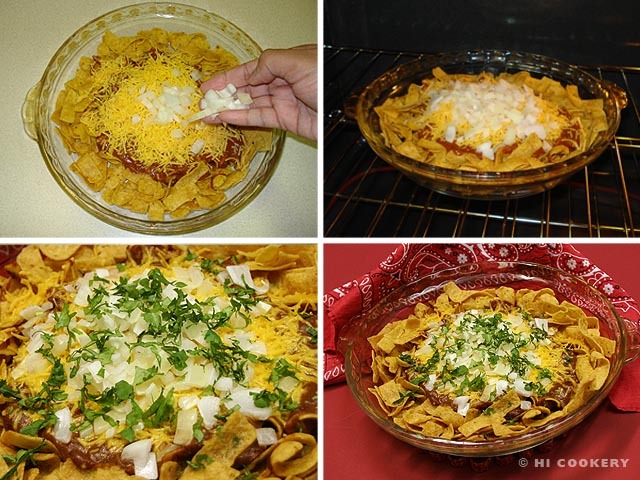 A “cleaner and classier” method to making Frito pie is to bake it in a pie or casserole dish. 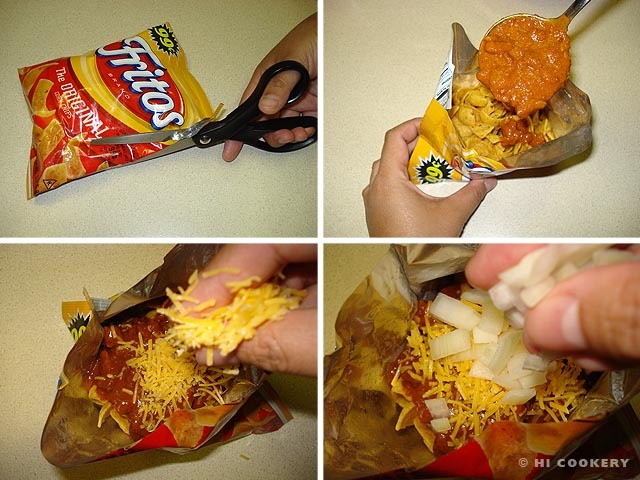 Layer it with corn chips, chili and cheese. Sprinkle the onions over the layers. Bake in a preheated oven at 350 degrees F for about 10 minutes or until the cheese is melted. Remove from the oven and add the cilantro garnish (optional) on top. Serve immediately. Try our Texas chili recipe for the filling in Frito Pie. We made the “no beans” style chili for National Chili Day on February 25.